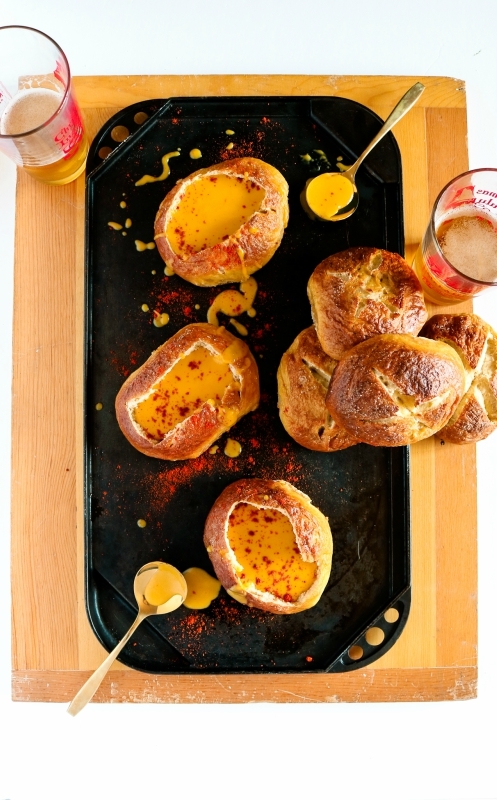 Vegan Beer Cheese Soup in a Soft Pretzel Bowl - major comfort food! Remember when I said it’s a safe bet we’d be back with more uses for those soft pretzel buns? The idea for this vegan beer cheese soup came from the our amazing friend Kat! She’s a foodie genius and a kickass vegan warrior woman. If you’re not already following her on IG, go do that! 🙌🏻 She is @katmeowvegan. By the way, I am utterly convinced these vegan soft pretzel buns were MADE to hold the cheesy glory of this vegan beer cheese soup. They’re soul mates, damn. delicious. soul mates. If they got married and invited me to their wedding, I would cry at the sheer beauty of two foods so meant-to-be. 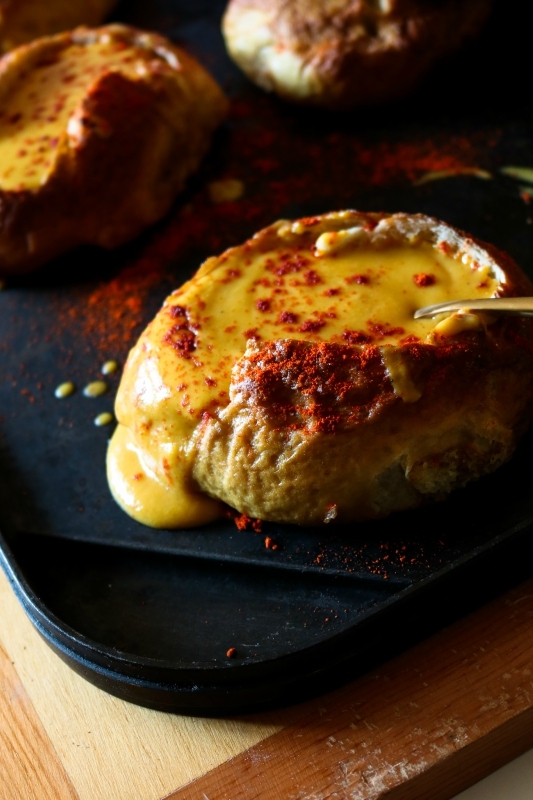 This vegan beer cheese soup is so ooey gooey and delicoius - a total comfort food! Plus, it's filled with hidden veggies and goes perfectly with these soft pretzel bowls. First, add 6-8 cups of water to a large pot and bring to a boil. Add the potatoes, carrots, and onions. Keep at a low boil - covered - for about 10 minutes (or until soft). While the vegetables are boiling, add mustards, oil, bullion powder, garlic, nutritional yeast, salt, and pepper to your food processor.When veggies are finished boiling, strain them and add them your food processor. Blend until smooth and then blend a little longer to allow the oil to emulsify. Then, add the contents of the food processor to the pot once more and pour in the 8 Oz of beer. Cover and bring to a boil and then, let it simmer for 7-10 minutes, uncovered. If the soup becomes too thick for your taste, feel free to add a little more of the reserved water until it reaches your desired consistency. Taste and adjust seasonings. You may want to add more salt. Now, get out your soft pretzel bun and use a sharp knife to cut a triangle into the top, careful not to go all the way through the soft pretzel bun. Scoop the bread out with a spoon to create space for the soup. 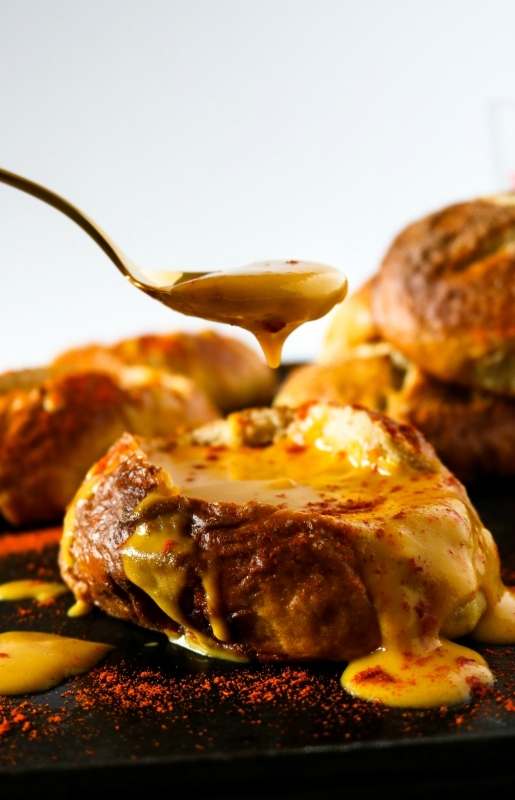 Pour delicious cheesy soupy goodness into soft pretzel bowl, sprinkle with paprika (optional), and enjoy! The link for the vegan pretzel buns isn't working. Can you let us know more? This soup is amazing! I added chopped broccoli for some extra veggie power and found pretzel buns at a local bakery. This came together quickly and will go in our regular rotation! This soup is tailgate-worthy, too! Thanks for creating it!